Hewlett-Packard's first Windows 8 tablet will be a business-oriented slate running an x86 CPU, not a consumer product running Microsoft's upcoming Windows RT operating system, the company has announced. Windows RT is a version of Windows 8. It's designed specifically for tablets and other devices that use Nvidia's ARM processors. HP hasn't ruled out an ARM-based slate running Windows RT, but says its initial Windows-tablet efforts will focus on business customers. Microsoft recently surprised the tech world--and perhaps its longtime PC manufacturing partners as well--by announcing two new tablets it plans to sell under its own brand. The upcoming ARM-based Surface for Windows RT is a consumer device, while the pricier and more powerful Surface for Windows 8 Professional features an Intel Core i5 (x86) CPU and is target at business users. The tablet announcement is a dramatic change from Microsoft's traditional OS business model, where it licenses Windows to hardware makers such as HP, Dell, and Acer, who in turn build and sell PCs running the Microsoft OS. "HP continues to look at using ARM processors in business and consumer products. 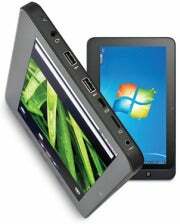 However, our first Win 8 tablet will be on the x86 platform focused on the business market. The decision to go with x86 was influenced by input from our customers. The robust and established ecosystem of x86 applications provides the best customer experience at this time and in the immediate future." So why is Hewlett-Packard is building a Windows 8 Professional slate first? Some reports suggest HP and its fellow Windows PC builders are miffed at Microsoft for encroaching on their turf with the Surface tablets. Another potential problem is cost. A recent poll of vendors by VR-Zone at the Computex Taipei trade show reveals that Microsoft is charging its hardware partners about $85 per copy of Windows RT, making it darn near impossible to turn a profit on a sub-$500 consumer slate. Finally, there's the possibility that a business-oriented tablet is simply a smarter play for HP, which over the past year has refocused its efforts on higher-margin enterprise customers. A Windows 8 tablet with an x86 CPU--one similar to Microsoft's own Surface for Windows 8 Professional--could run standard Windows programs such as Microsoft Office and Adobe Photoshop, thereby making it more appealing to business users.